This post was sponsored by KOOV by Sony. All opinions are mine. Take the fear out of teaching STEM with a fun, robotics kit that will have your kids creating, coding, and problem solving in no time. Right now, there is a big push for STEM (Science, Technology, Engineering, and Math), or STEAM (Science, Technology, Engineering, Art, and Math), education in the U.S as technology advances and new high-tech jobs are being created. According to the World Economic Forum, “65% of kids entering primary school will work in jobs that do not exist yet.” We need to equip our kids to be able to move into these jobs by giving them a solid STEM/STEAM education that includes both technical knowledge and problem solving skills. Schools are racing to implement STEM, coding, and robotics courses. Educators with the skills to teach these classes are being sought after. Current teachers are being further educated on STEM subjects and some professionals that work in STEM fields are making the transition to classroom teacher. Homeschool parents with no STEM background might feel at a loss. How can they compete with a school system that offers STEM related courses and experiences (such as robotics or engineering clubs)? Over the years, I have become a huge fan of STEM kits. You know, the ones that come it a box with all the the supplies and instructions (or how to log into online instructions) included. They allow parents to give their children a fun, successful STEM experience in areas the parents may or may not be educated in. I was recently introduced to the new KOOV Educator Kit by SONY. This impressive resource allows students 7 years old and up to gain experience in all stages of robotics from design to coding to construction. With KOOV, kids are encouraged to be creative and to learn skills the make their creations come to life. This design to implementation approach really struck home for me. My daughter is in her third year on a FIRST Robotics team. This is a international competitive robotics program for high school students. When she first joined the team, she wasn’t sure what role she would play. Her team is divided into groups: programming, computer-aided design (CAD) and 3D printing, mechanical, electrical, and business. The team spends the first few months of the season honing skills and giving new students the opportunity to try out all the groups and look for a good fit. My daughter has settled into the CAD group. There she has learned to use design software and to work with the other groups to design and 3D print needed parts. By doing this, she is gaining knowledge in all areas of robotics, learning to solve problems along the way, and having fun at the same time. 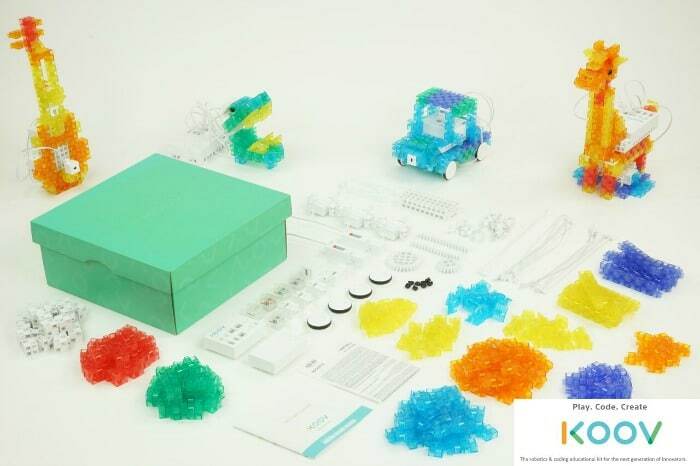 The KOOV Educator Kit allows kids to have the same experience on a smaller scale. In fact, I wish my daughter would have had used the KOOV kit before she started her team to give her some skills and confidence going in. With the KOOV Educator Kit, kids learn by doing. They are guided by a 30 hour online course that teaches them all aspects of building a robot in a fun, hands-on way. The program included in this robotics kit is designed so that kids can learn to build and code independently. Teachers and parents can supervise, but do not need to do the teaching or be an expert in robotics! KOOV breaks the robot building and coding process into three steps. Kids use the over 300 building blocks to create their robot. They are encouraged to be creative in this process. Kids can use their imagination to come up with a robot design or they can start out with one of the provided robot “recipes”. These recipes are helpful as kids are first going through the course. Included in the kit are a large array of sensors, motors, lights, switches and other components that, when added to the robot, make it come alive. Kids will learn to code using the KOOV app. This app is designed to allow kids to learn independently. It breaks the coding process down into small pieces, so kids can learn easily and at their own pace. The code the kids create will give the robot its instructions and tell it what to do. The KOOV app uses a simple drag and drop interface which allows kids to code immediately with no prior experience necessary. Share! Through the KOOV app, kids can share their robot creations with other KOOVers around the world. They can be inspired by other awesome robots and be encouraged to keep learning more. I’m not going to lie. The KOOV Educator Kit isn’t cheap. The cost is higher than the typical STEM or robotics kit by quite a bit. However, this isn’t the typical STEM kit. That is why I believe the price/investment is worth it. This kit is huge! With over 300 building blocks, a plethora of components, an online app, and a 30 hour course, this is a steal! Includes a 30 hour course. Seriously, SONY put together an interactive, hands-on coding and robotics course that will feel like it is tailored to your child. How much do you pay for lesser classes? Can be used with multiple kids. One KOOV Educator kit can be used with up to 5 kids. Divide the cost. Bam! No brainer. Can be used for multiple age groups. The KOOV robotics kit is designed for kids ages 7 and up. This means it is for EVERYONE over the age of 7. This is a fun resource that can teach real STEM skills to all ages. It’s open ended. This is not a one-and-done type of resource. Your child is probably not going to use this once and pack it up. Once they figure out how many types of robots they can make and all the functionality they can build in, KOOV will become a regular part of your homeschool. Check out the KOOV website for more information and to order the KOOV Educator Kit to get started!